Letter from US Department of Veterans Affairs indicating disability percentage and service connection is required. 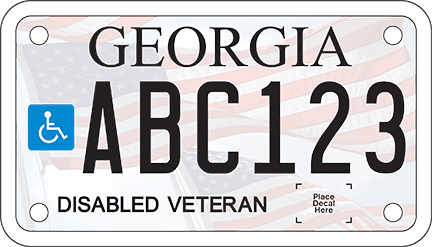 The Georgia Department of Veterans Services(GDVS) is available for assistance. FOR AD VALOREM TAX or TITLE AD VALOREM TAX EXEMPTION(TAVT): Persons who are 100% Service Connected Disabled are exempt from Ad Valorem Tax and/or TAVT on one vehicle only. (OCGA 48-5-478) Discharge under honorable condition. A set of plates with the same number will be issued for the vehicle. Only one additional set of plates will be issued. In the event of the death of the person who received the special license plates pursuant to this Code section (OCGA 40-2-69), upon complying with the motor vehicle laws relating to registration and licensing of motor vehicles, his or her surviving spouse may continue to receive the free special license plates and revalidation decals until the death of the surviving spouse.